Anti-oxidants protect your health and prevent early aging. Which one of us hasn't heard of this health claim? What are anti-oxidants and how do they work? Read on to understand the activity of these wonder compounds. Breathing, physical activity, stress and smoking, exposure to certain chemicals or any other general processes in our body produce substances called free radicals that attack healthy cells. When these healthy cells are weakened, they become susceptible to many degenerative diseases. Anti - oxidants such as Vitamin C and E, carotenoids (beta carotene, lycopene and lutein etc.) help protect healthy cells from damage caused by free radicals. 1. Carotenoids: There are more than 600 carotenoids present in food that we consume. Among them, beta carotene, lycopene and lutein are well known to fight and reduce free radical activity. Beta carotene is linked to preventing heart attacks, irregular heartbeats, strokes and cancer, especially lung cancer. 2. Glutathione: Glutathione is also an important anti-oxidant that is said to de-activate at least 30 cancer-causing substances and also helps block damage from toxic compounds from environmental pollutants. Water melons, sweet limes, oranges, strawberries, ladies finger, cauliflower and tomatoes are the richest source of glutathione. 3. Indoles: Major food sources of Indoles include the cruciferous family-radish, mustard, cabbage, cauliflower, beet roots and turnips. Indoles work by detoxifying cancer-causing agents and are highly successful in blocking colon and breast cancers. 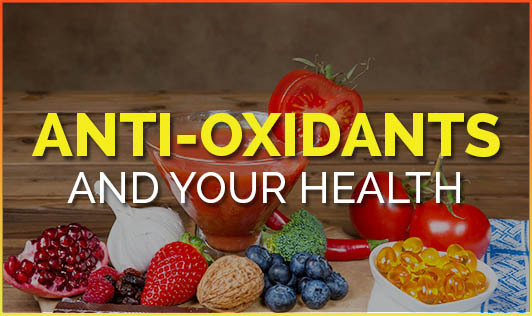 There are many more anti-oxidants that will help prevent many degenerative diseases. Apart from these compounds there are several enzymes and myriad exotic compounds present in fruits and vegetables that have various bio-chemical functions that help protect your cells. Our body can act as battle grounds for many infections and diseases, provided we eat the right kind of foods.